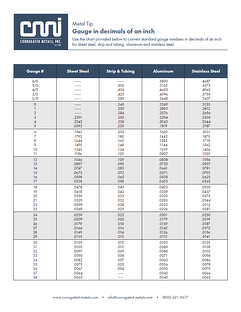 Acess the chart to convert standard gauge numbers in decimals of an inch for sheet steel, strip and tubing, aluminum and stainless steel. Complete the form on the right to download the PDF. Please fill out our contact form to download the Metal Tips Gauge. You may also email us at info@corrugated-metals.com or call us at 1-800-621-5617, to learn how you can benefit from using CMI’s roll forming and metal corrugating services.